This musical wireless doorbell chime connects to your existing traditional hard wired doorbell and extends where you can hear your doorbell from. This musical wireless doorbell chime connects to your existing traditional hard wired doorbell and extends where you can hear your doorbell from. Once the unit is wired into your existing system, the included receiver can be plugged into any standard electrical outlet up to 500' from the existing doorbell. 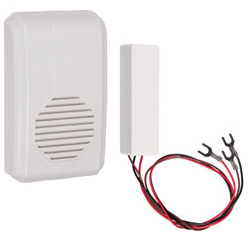 This allows you to hear when someone is at your front door when you are in the basement, garage or other part of the house or business, where you normally can't hear your doorbell. You can distinguish between front and back doors by adding more transmitters and programming a different tune on each. There are two sounds that can be selected with the push of a button on each transmitter. For security, there are 32 individual codes to protect against outside interference. Unit is FCC certified. Two 3-volt lithium batteries for transmitter, included. Note: This product may not work properly with some door chimes that play melodies or use batteries.